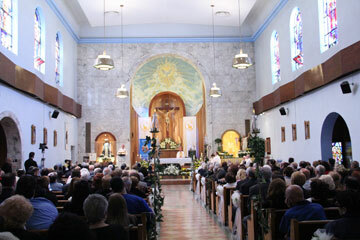 St. Nicholas of Tolentine Parish in South Philadelphia celebrated “Cent’anni,” 100 years of service to the Italian community in South Philadelphia on April 29. Its actual beginnings were as a mission chapel of nearby Our Lady of Good Counsel Parish (1898-1932). Augustinian Father John Cerutti, formerly the administrator, became the first official pastor. The parish church, still in use to this day, was actually dedicated in 1928. The parish school, established in 1925, was originally staffed by the Franciscan Missionaries of the Sacred Heart, but since 1951, the Sisters of St. Lucy Filipini have taught at the school. Although he did not attend St. Nicholas School, Augustinian Father Nicholas Martorano, who has been the pastor since 1984, has spent virtually his entire life in St. Nicholas. After graduating from neighborhood public schools and La Salle College, he taught sixth grade at St. Nicholas for a year before joining the Augustinians. In 1984 he was sent to the parish as administrator due to the pastor’s illness and three months later became pastor himself. Although St. Nicholas was established in an era that saw a huge influx of Italians to the formerly Irish neighborhood, the ethnicity today is somewhat multi-cultural. But St. Nick’s keeps the old traditions, including a weekly Italian Mass and an annual street procession and festival the first Sunday in October that celebrates the founding heritage. In keeping with custom, statues of traditional Italian saints will be paraded along with a couple of modern additions — St. Pio and St. Gianna Molla. Retired Auxiliary Bishop Louis A. DeSimone, Philadelphia’s first bishop of Italian heritage, was celebrant and homilist at the Centennial Mass. An honorary Italian — Auxiliary Bishop Michael Fitzgerald, who is fluent in Italian thanks to his Rome studies, concelebrated the Mass. Bishop Fitzgerald has a special connection with the parish; he celebrated the weekly Italian Mass at St. Nicholas for years. At this point, demand exceeds church capacity for the anniversary Mass. Dolores LaRosa, born in the parish and living in it virtually all of her 82 years, considers St. Nicholas “one big happy family where everybody knows one another.” In her view it is Father Martorano who makes the difference. “People go to him because of his charisma,” she said. Peter Spina, the parish choir director and general chairman of the anniversary celebration, was born in St. Nick’s 54 years ago as was his father before him. Right now the big push is for the anniversary celebration, and Spina, who also has a band, the City Rhythm Orchestra, promises it will be big. “We have Joe Piscopo coming for it,” he said.